It’s shameful how Apple provides only 5GB of free iCloud storage to customers, no matter how many devices they own. It’s simply not enough space for all the photos and videos we shoot these days. Now there’s a plug-and-play solution that takes the burden of backing up personal media off of the Cupertino-based company’s shoulders. As photos and videos are being backed up, the Picture Keeper Connect app displays a thumbnail for each file. 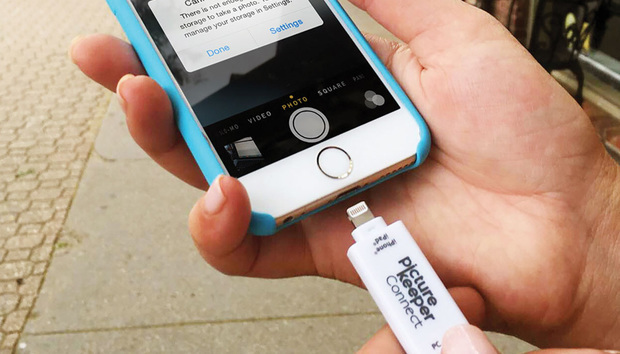 At roughly 3.5 inches long, 0.75 inches wide, and 0.25 inches thick, Picture Keeper Connect looks like a standard FAT32-formatted USB thumb drive—and it is, with the addition of a Lightning connector at the opposite end for use with compatible iOS devices. I have over 20,000 photos stored in iCloud Photo Library and tested the lowest-capacity 16GB model ($49 on Amazon); 32GB ($75 on Amazon and 64GB ($76 on Amazon models are also available. I had reservations, since the 16GB device certainly couldn’t handle all of my data. As it turns out, there’s a setting to disable backup of iCloud Photos content, instead targeting only those full-resolution files actually downloaded to the device; videos and contacts can also be independently disabled. When a Picture Keeper Connect fills up, another can be purchased to pick up where the previous one left off. But it’s not the cheapest backup method around, and the storage itself isn’t upgradeable. The app scans for content each time, performing an incremental backup of only what’s new. Picture Keeper Connect also provides an alternate backup method that doesn’t require a USB drive and is free for anyone to use. The first time you open the app, you’ll be asked to register for an account, which is used for temporary backup. Within 48 hours, you can log in from the Mobile Helper application on Mac or PC and safely download files to your computer. Picture Keeper Connect backups are incremental and can span multiple drives, and the app can even send reminders so you won’t forget to back up in the future. Mobile Helper eliminates my biggest complaint with Picture Keeper Connect: If you have thousands of photos to back up, the thumb drive drains your battery quickly. I watched the power level drop from 75 percent to less than 25 percent after only an hour, so you’ll want to charge up first. With Mobile Helper, the Lightning port can be used to stay powered, which you’ll need to do since it’s a much slower method. The beauty of Picture Keeper Connect is you can set up different accounts for everyone in the family, and back up all of their content to the same USB drive. Unlike many cloud backup services, PKC doesn’t rename original files; they’re copied straight across, sorted into folders based on album name. In the case of apps like Instagram, Snapchat, and Twitter, this is a good thing, because photos saved from those services get backed up. Unfortunately, iCloud Photo Sharing images also come along for the ride, even if you’re the one who shared them originally I’d love to see more granular control over what gets backed up in future updates. Picture Keeper Connect is a pocket-friendly product for backing up all of your iOS devices, and it’s easy enough to for everyone in the family to use.